This summer both Seirian and Emily attended the International Union for the Study of Social Insects international conference in Cairns, Australia. The event was hosted in the Cairns Conference Centre next to the Great Barrier Reef and really was a stunning location. Social insect researchers from all over the globe gathered to present and discuss their science. Seirian and Emily successfully gave talks during the week addressing the use of genomics in understanding social evolution and caste plasticity in tropical wasps. 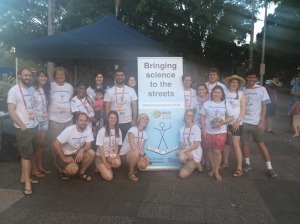 In addition to this they ran a Popup Science event bringing together researchers from the conference onto the streets to engage with the public about their work. We event had some live Australian social insects joining us for the festivities. To see some what else happened during the conference check out the official website.